We’d love your help. Let us know what’s wrong with this preview of We Can Be Heroes by Robert Dean Lurie. To ask other readers questions about We Can Be Heroes, please sign up. "Although its basic outlines are familiar, Lurie tells the story of Bowie’s transformation clearly and engagingly. The question is whether Bowie’s performance art should really be characterized as a kind of philosophical argument. I am skeptical that this is a useful way of understanding Bowie’s significance. His “changes”, as he called them, have received lavish attention from critics and obituarists. As Rod Liddle has pointed out in The Spectator, however, these tributes ignore the fact that B "Although its basic outlines are familiar, Lurie tells the story of Bowie’s transformation clearly and engagingly. The question is whether Bowie’s performance art should really be characterized as a kind of philosophical argument. I am skeptical that this is a useful way of understanding Bowie’s significance. His “changes”, as he called them, have received lavish attention from critics and obituarists. As Rod Liddle has pointed out in The Spectator, however, these tributes ignore the fact that Bowie was far from the only rock star to play around with costume, aesthetics, and musical styles. Outside of the most grimly sincere subgenres, musicians change their images about as often as ordinary people change their shirts. The reason isn’t radical individualism so much as Rand’s other great obsession: the pursuit of wealth." I thoroughly enjoyed this engaging little book. I've read several different summaries, accounts, analyses, and bios of David Bowie and his work, and this new volume by Robert Lurie stands out. It's extremely well written, and is based on a depth of scholarship which extends far beyond music and pop culture. I thoroughly enjoyed how the author explored Bowie's reading, the different influences on his thought at different periods, and how he explored it through his music. The emphasis on Bowie's i I thoroughly enjoyed this engaging little book. 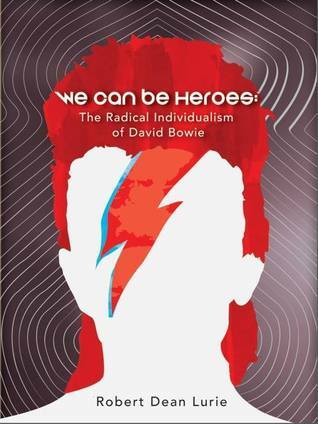 I've read several different summaries, accounts, analyses, and bios of David Bowie and his work, and this new volume by Robert Lurie stands out. It's extremely well written, and is based on a depth of scholarship which extends far beyond music and pop culture. I thoroughly enjoyed how the author explored Bowie's reading, the different influences on his thought at different periods, and how he explored it through his music. The emphasis on Bowie's individuality, on following his own path, and thriving on opposition when audiences and record companies didn't share that vision, appeals strongly to me. I think this book captures that driving force of this incredible artist extremely well. I also highly recommend Robert Lurie's earlier book, "No Certainty Attached: Steve Kilbey and The Church" (Verse Chorus Press, 2009). I knew David Bowie was an interesting person but I didn't know how interesting. This book gave some interesting details into his life from beginning to end. A great read and lots of great information shared. Robert Dean Lurie is a writer and musician based in Tempe, Arizona. He received his MFA in Creative Writing from the University of North Carolina Wilmington and is the author of "Begin the Begin: R.E.M. 's Early Years," "We Can Be Heroes: The Radical Individualism of David Bowie," and "No Certainty Attached: Steve Kilbey and The Church."